C.K Magma, the range of premium storage from C.K has unveiled a brand new look, following an extensive rebrand. Continuing to put tradesmen at the heart of the business, the rebrand follows extensive research and feedback from customers of the innovative brand. The revamp will enhance and refresh the popular tool storage specialist brand, and directly answers feedback from a dedicated group of professional tradesmen customers, ensuring that the working needs of those using the existing range of durable, functional and reliable products are fully met. With the rebrand comes a whole host of interactive aspects, allowing tradesmen to really engage with C.K Magma products. Detailed and eye-catching packaging, incorporating the well known C.K logo will be instantly recognisable, with QR codes that instantly play product videos and demonstrations, giving tradesmen the information needed on a particular tool, at the touch of a button. An updated website encompasses the refreshed branding, boasting a wealth of interactive features; including a social media feed and share buttons for Facebook, Twitter, Vimeo and Youtube, allowing customers to interact and to keep up-to-date with the latest product news and developments. In addition, the website also provides areas for reviewing items, giving tradesmen a platform to share their experiences of the products with one another. The use of lifestyle photography and testimonials from a trade panel of experts demonstrate how real life users have benefitted from the quality products, and proves that the products truly perform on the job. The website also features a stockist search facility, making it quick and easy for tradesmen to find a nearby retailer. Customers can also download the revamped catalogue, and sign up to receive the C.K Magma newsletter, keeping them further updated on the latest products and offers. With the rebrand comes a new range booklet, a mini version of the catalogue found inside the tool bags when sold, which encompasses a host of informative features. The use of the impactful title ‘Storage Just Got Serious’ reflects the professional image of the brand, whilst the inclusion of lifestyle photography of the products in use and in depth explanations of the items gives tradesmen details of the entire range. Vanessa Molloy, C.K Magma brand manager said: “We are hugely excited to be launching the refreshed C.K Magma brand, boosting the existing popularity of this range and refreshing its image. 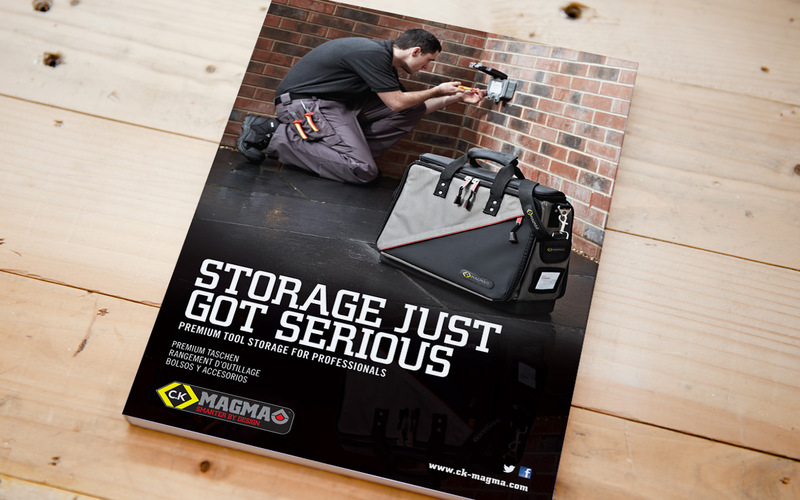 “We pride ourselves on our in depth research, aided by a trade panel of experts, which guarantees that the evolved brand meets the requirements of tradesmen, to ensure they can continue to rely on the C.K Magma products already available. For more information or to find your local stockist, call C.K tools on 01758 704704.